The Apple Watch has only been on my wrist for 24 hours, but already I'm missing the Garmin. And that's after only one run. I've been trying to decide whether or not to write about Cupertino's digi-timepiece in this column given it's not a 'proper' running watch and could hinder my quest to become a triathlete in a ludicrously short amount of time, but given it's the only tech my running chums have asked about for the last two weeks, it needs a dabble. 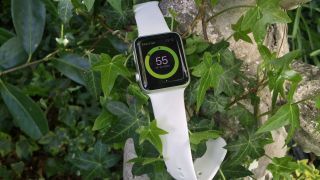 The Apple Watch has a heart rate monitor on the back, it's a light little gadget, and while it doesn't have GPS inbuilt, it can either draw from the iPhone's chip if you're running with that or actually learn your cadence over time from training with the smartphone tethered. And I've just tried it for the first time in anger as a runner at the local Parkrun. Today was about keeping things simple: turn up at the start line, turn the Watch on, and go. And I did. It counts down to start you off, which is annoying, as when someone says 'GO!' having to anticipate it by 3 seconds is tough. It's a good feature on a phone, as it gives you time to put the thing away before starting, but on a watch it's redundant. So off I went, the Smartwatch in the Spotlight swinging away on the wrist. And almost instantly I realised the Apple Watch wasn't going to be any help on this run. The screen is off unless you lift your arm up, and even then you'll just see the time you've run for, with swiping needed for other info. I want info on current pace, distance, time and the ability to set things like a virtual pacer. The heart rate monitor should be an option to train to, not just an idle interest that gives a meaningless number to most. The watch buzzed nicely every mile to let me know how far I'd gone, but that was the extent of the mid run info. I crossed the line, and over the course of 5 kilometres the Fenix 3 I was also wearing to compare had tracked me at 4.9km and the Apple Watch at 5.1km, which isn't bad for a pedometer. But then I found the biggest issue: if you miss the snapshot summary post run then it's lost for good, it seems. The Watch will log it, but I couldn't go back in to review what I'd done – things like mile splits, heart rate during etc were all inaccessible. All I was told when I started the app again was my furthest run / most calories burned etc. The good news is apps like MapMyRun are Watch compatible from the start, so I'll give those a go soon and they should offer better insights into my trottings. But it's pretty clear that the Apple Watch is there for the very new or very casual runner who wants so simply set a calorie / distance goal and when they've hit it, that's the end of that. I'll give it a few more tests before passing any kind of judgement though – it would be unfair to rate this device after 20 mins of running. Anyway, back to the horror that is my triathlon training. I'm back at the pool for my swimming session, and we're being taught to tread water efficiently. Except I can't. I keep sinking while everyone else is gliding around like ecstatic water nymphs. A few lengths later, I'm starting to panic. The YMCA pool is filled with people who pretend to be 'not very good' at swimming but I'm a lot slower. I'm spluttering. My technique is terrible. For the first time in years I think I might not meet a challenge I've foolishly subscribed to. Then I realise that this is just the beginning. No man does it all by himself. I need to put my pride my pride on the shelf, get to the end of the session and just keep going. I've also been trying out the Gamin Fenix 3 as the tech on test this week. It can do everything that the 920XT – my current watch of choice – can do (and more), it's round and it's made of metal. Sure, it's huge but it's definitely more of a 'grown up' watch, and man, this thing can do EVERYTHING. I should point out that it costs £350 / $600 – this isn't cheap, and that's without the heart rate monitor. But if you want to do any sport, be it swimming, cycling, triathlons, Nordic skiing, trail running, snowboarding – it's all there. The first thing I tested properly was the swim recording – and it was generally pretty accurate, although the length counting seemed to go awry at times, with 'phantom lengths' thrown in. (Nor could it measure a pool smaller than 17 metres, which is a problem when I want to train in my teeny tiny baby pool where nobody is watching). 1.4km and 90 minutes later, I dragged myself out the pool. And then… Ow. OW. My shoulder hurts. Why does my shoulder hurt? Turns out I've (hopefully mildly) irritated my rotator cuff, almost certainly through poor technique and going swimming too much, too soon. That, or the fact I tried to race the best guy in the class at the end of the session because I was fed up with being at the back. So I decided to lay off the swimming for a few days, let it recover, and spend some time on running and cycling. Man, there's nothing better to make you fall back in love with running than being awful at another sport. A 10 mile session up some horrendous hills was completed with a smile on my face as I wasn't in a pool. This week I also finally began some longer cycles too – 10km to and from a local station on the way to work was easier than I thought it was going to be, and not too shabby speed-wise, according to the Fenix 3. I feel bad talking about the Fenix 3 so quickly here so I'll continue using it for the next week or two – it's a fabulous watch with a battery life that happily lasted 5 days, with GPS or swim tracking morning and evening. I feel the need to take it off soon though; after all, it's the triathlon mode on the other multi-sport watch that got me started on this stupid plan. The backlight is odd – where it's quite intuitive on the 920XT, it doesn't like staying on with the Fenix 3, which I assume is due to battery saving. It's annoying when you want to use the watch as cycle monitor, as you have to head in and manually force it to stay lit. The fit isn't the best either – it's quite hard to fit the strap through the loop. It sounds trivial, but for a super expensive watch, I'd expect perfection. I'm giddy with excitement about the next week or so. I'm going to be testing out the Xbionic shirt, which uses 'hot zones' on the spine to trick your skin into sweating and improve performance. MORE excitingly I'm going to finally be getting my hands on the Recon Jet headset – it's the cutting-edge in running geekery. Google Glass for runners? Yes please. AND EVEN MORE excitingly I'm going to be heading down to GlaxoSmithKline's Human Performance Labs to be told things like 'You're really bad at swimming' and 'You're tubbier than we expected someone who runs a lot to be'.